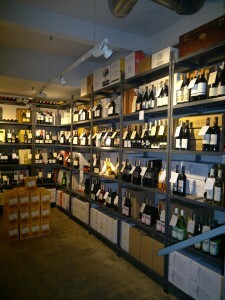 The Wine Garage – Heaven Underground? In a country where disposable income seems to be increasing rapidly, the world of wine is only at it’s infancy with hopefully only one direction to go and that’s up. This will be of course an “uphill” battle in a country that consumes loads of Vodka (which is very cheap) and beer (also cheap). They also have a vast variety of “wines” from central Europe which on average can cost half as much as the wines from what I call the “Old World”. Still, people seem to be talking about wine and wine shops seem to be opening up as fast as you can imagine. Yet, in Krakow (Poland’s second most populous city with a population of just over 750,000), there is a serious lack of wine bars. I can count them on one hand and still have some fingers left over. Just to give you some perspective, in Bergen where I currently reside, there are at least 5 wine bars. Bergen is a city with one third the population of Krakow and is in a country that doesn’t (yet) produce wine (Poland does, by the way). Despite this, one wine bar is surviving and even growing. Welcome to the Wine Garage. Wine Garage (the bar) got their start about 18 months ago. 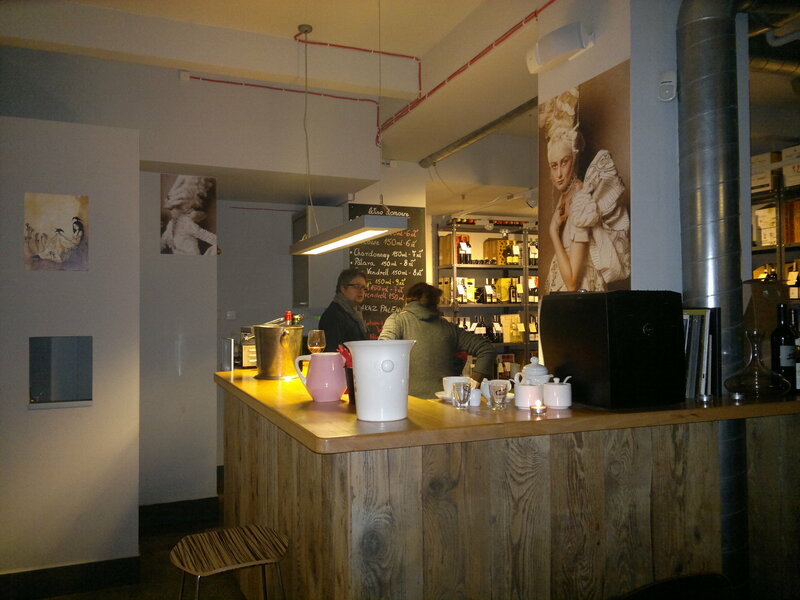 Not only is Wine Garage a nice, cozy spot to drink some good wines, but the owners Mariusz and Agnieszka have also been importing and distributing their wines throughout Krakow for the last 5 years. They focus on organic and biodynamic products (they also have a small selection of coffees and teas) from mostly small producers from Italy, France, Hungary and even Moravia (Czech Republic). 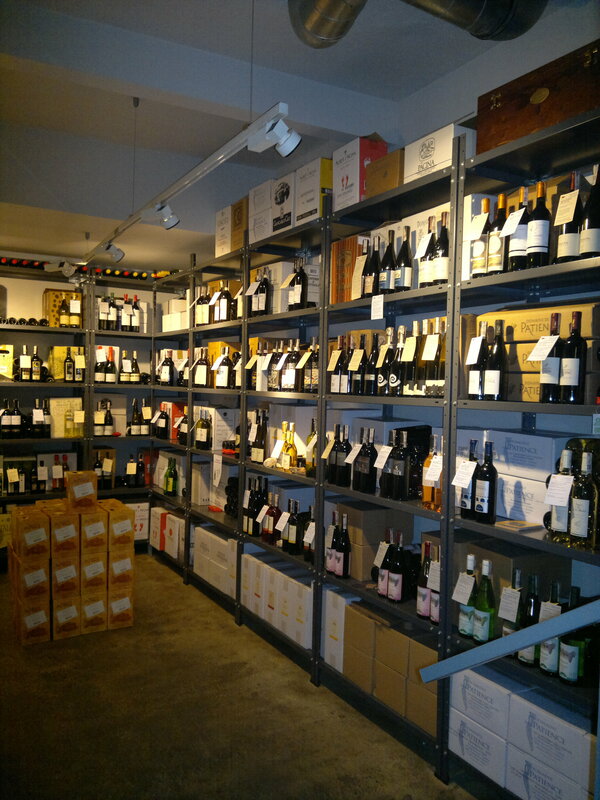 Wine Garage is located underground (that is, one floor below street level) on a small residential street about a 5 minute tram ride from the historic city center. 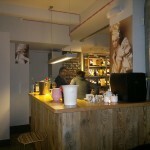 The vibe is very informal and easy going, making you feel welcome and relaxed from the minute you enter and come down the stairs. Sit and enjoy a glass of wine with some cheese, or buy a bottle to take with you. It’s up to you. In countries where a new economy is booming, many people with these new found riches like to show others by proudly displaying recognizable labels from not only marks like Mercedes Benz and Prada, but also wine labels like Möet & Chandon and top Bordeaux’s. This makes Mariusz and Agnieszka’s job even tougher trying to sell items with little known, non-conventional labels. But it seems to be working out for them because as I write this, they are preparing to open a second location right smack in the city senter. Ok, now on to some wine! Last night I had the privilege to get to together with Mariusz, Agnieszka and a few other wine enthusiasts to taste some wine. 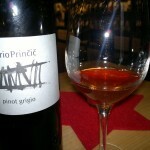 The first wine we started with was a bottle I brought with me, a 2007 Dario Prinčič Pinot Grigio. Seven days of skin contact gives this Pinot Grigio an unfamiliar hue that most wine drinkers wouldn’t expect. This pinkish-skinned grape is usually made into a white wine, which I feel is a shame since my two favorite Pinot Grigio’s are made with the skins, like red wine. Dario’s Pinot Grigio is made with grapes grown in a very natural way, only spraying sulfur if he really needs to and nothing more. His philosophy is carried over into his wine making where, you guessed it, nothing is added, not even the yeast. He checks his free sulfur levels before bottling (he adds none during the wine making process), and sometimes adds a little just to get the number up to about 20mg/liter. I love this wine, and the others seemed to enjoy it as well. Aromas of orange peel and tea, spices and herbs. On the palate the wine is simply delicious. Fruity, mildly tannic and even at 14% alcohol, extremely refreshing and easy to drink. 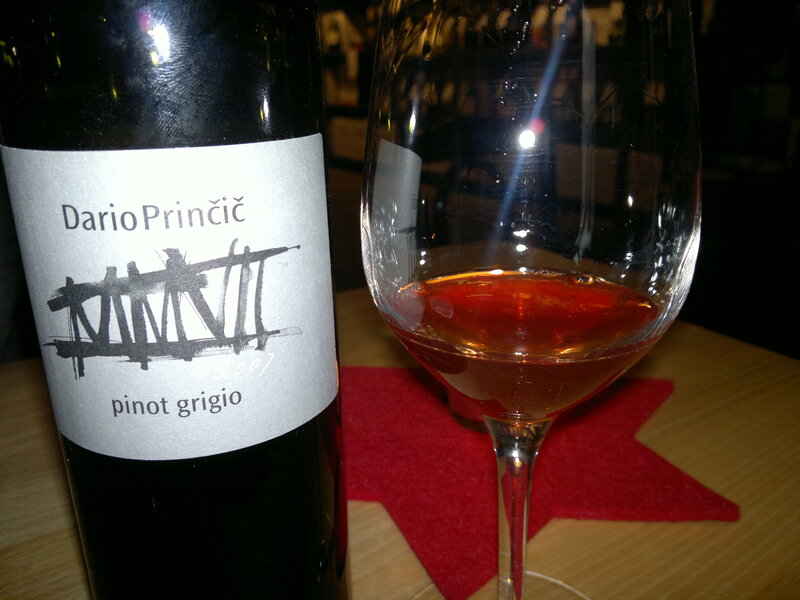 Perhaps the best Pinot Grigio I have tasted (or should I say – perhaps my favorite Pinot Grigio thus far). 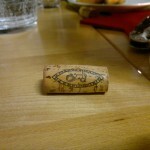 The second two wines were sponsored by wine enthusiast Kuba. The first of the two was a “mature” Burgundy. 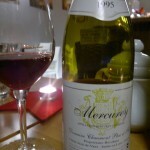 A 1995 Domaine Chaumont Pere et Fils Mercury that he found at a very reasonable price (about 100 Polish złoty – or about $34). Kuba had drank a bottle just the night before and was pleasantly surprised by it, so he decided to pick up another for this tasting. I don’t know much about this producer except that the grapes are his own, not purchased. The wine appeared more youthful in the glass than the age would suggest. The same held true on the nose. 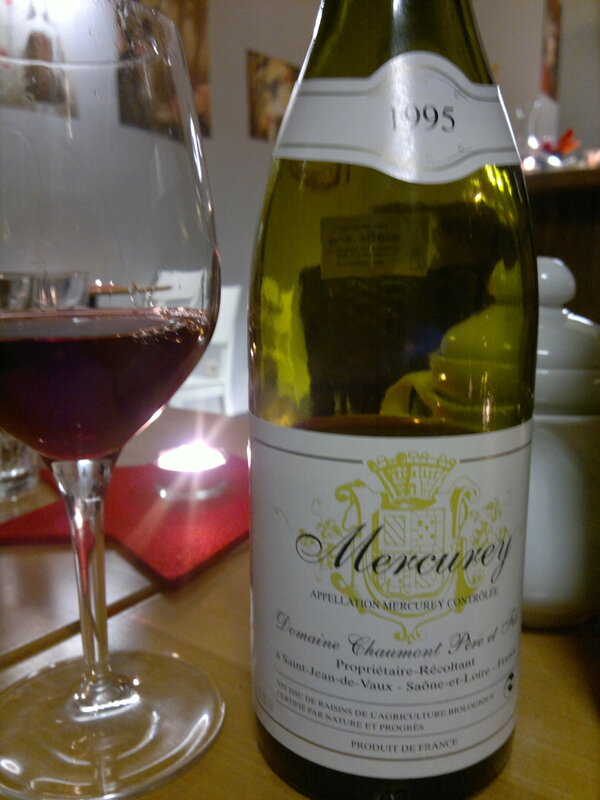 No dominant oak here, just fresh red fruit, some herbs and hints of characteristic farmyard. The nose made me eager to taste, but I nosed the wine at least 5 more minutes because the nose made me so eager with anticipation that I wanted to delay the pleasure a bit. When I did finally take a sip, I have to admit that I was disappointed. The wine still had it’s tannins and acidity in place, but the fruit was no where to be found. Have I just found my favorite H2O? We laughed a bit at the comment made by Kuba that the wine tasted like Pinot Noir-flavored water. The bottle he consumed the night before was still alive and fruity according to him.. Oh well… on to the next wine. The next wine was a surprise. 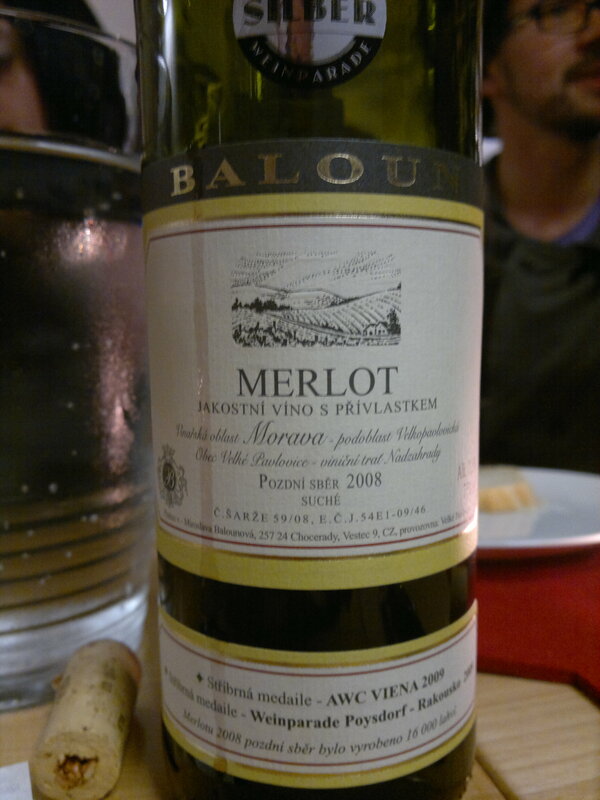 A 2008 Vinařství Baloun Merlot from Moravia. A very light, fruity and peppery wine carrying a modest 11.5% alcohol. When I first nosed the glass, the first aroma that hit my nostrils was pepper, and lots of it! Followed by very sweet, almost candied, red fruit. These two aromas I would never have expected to find together. Most of the “peppery” wines I have come across carried more earthy, less sweet aromas. This was strange. But, the more I aired the wine, the less candy-like the aromas became. The pepper stayed and now red cranberries were the dominant red fruit.. Now the wine was getting interesting to me. On the palate the wine was light, fresh and peppery with red fruit shoulders. Low acidity and no tannins make this the perfect quaffing wine on a hot summer’s day. 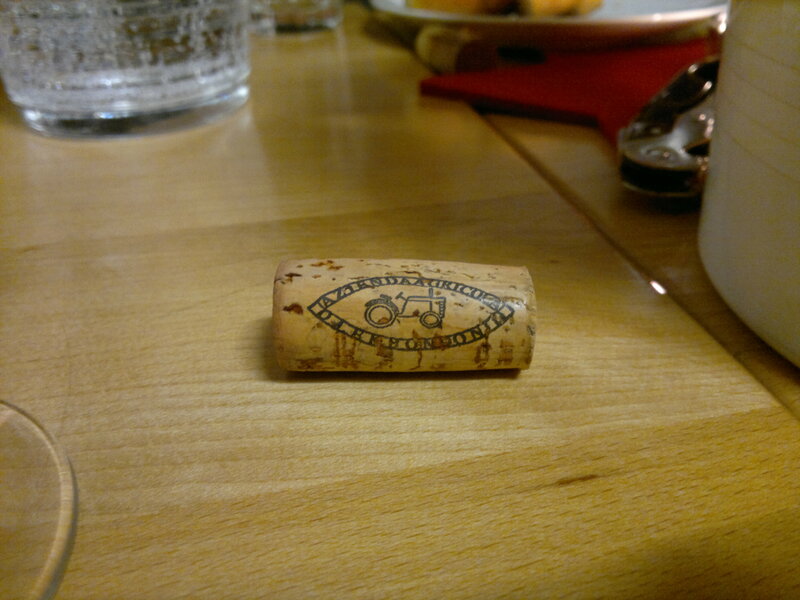 I enjoyed the wine, but I felt it carried a rather hefty price tag of 43 Polish złoty (about $11.50). We then moved on to a Spanish wine from Jerez de la Frontera provided by Carlos, a distributor for the wine. 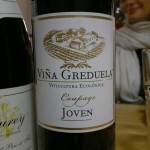 A 2009 Viña Greduela Coupage Joven. 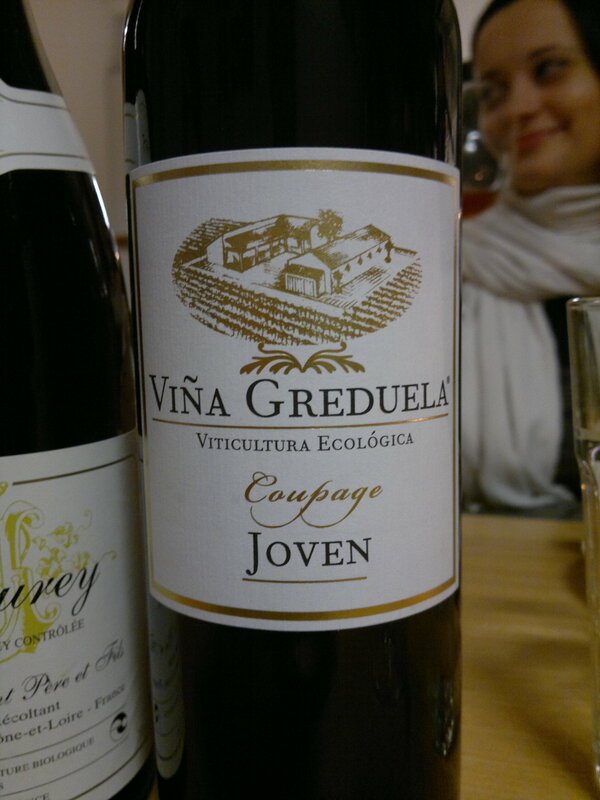 A bold blend of organically grown Merlot (40%), Syrah (30%), Cabernet Sauvignon (20%) and Tempranillo (only 10%). First aromas to hit my nose were quite intense. Ripe fruit, even some over ripe fruit characteristics, with mostly dark berries, plums and stewed plums. Hints of the yeast with a mild volatility suggested to me spontaneous fermentation. Very nice structure on the palate, refreshing acidity and medium plus tannins suggest that this Joven was young and could be possibly enjoyed for the next 5 years. A good wine, a drinkable wine. Not yet available in Poland. And the last wine that made an appearance last night was actually a wine provided to us by Mariusz and Agnieszka from the Wine Garage selection of wines. A new Piemontese producer for them (and for me as well). 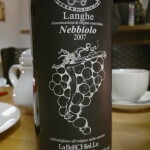 A 2007 Olek Bondonio Langhe Nebbiolo. An organic producer of Polish decent. 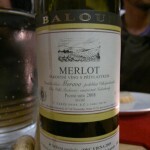 This wine was a modern Nebbiolo made in the slightly oxidative style. On the nose, the delicate aromas of the nebbiolo grape were hard to pick up at first whiff, but as the wine aired (and aeration it does need), the wine became a bit more characteristic. Structure on the palate was immense and the tannins were very round (rounded out by the storage in small oak barrels). This for some may not be an easy to understand nebbiolo, and for others may not be their style. Whatever the verdict, it’s a pricey nebbiolo at around 120 Polish złoty (around $41). Despite this hefty price tag, and the average person’s propensity to spend little money on wine in Poland, the wine is selling well says Agnieszka. That’s good news. All this wine made us hungry, so we were fed some homemade Bigos, a traditional Polish hunter’s stew. 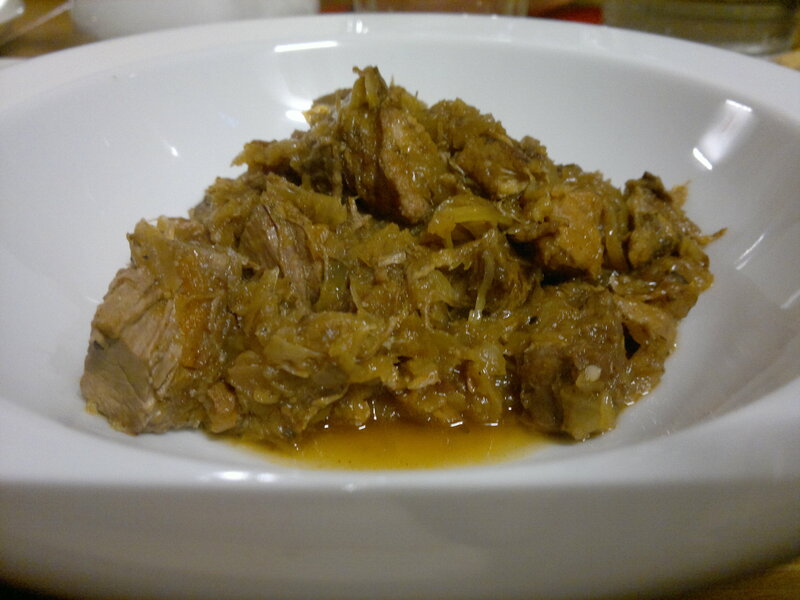 This Polish “national dish” is made with cabbage, sauerkraut, various cuts of meats and sausages and a few other ingredients. I’m told the longer you take to make the dish, the better it is! And, it’s supposed to get better the longer you keep it for. This was by far the best Bigos I have tasted in Poland. Thank you Agnieszka!